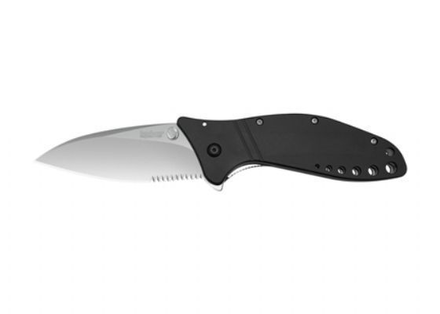 Kershaw 1630ST Cyclone Speed Safe Knife with Speed Safe technology features a 3.75-inch serrated blade made of Sandvik stainless steel. The Cyclone has an anodized aluminum handle with stainless steel liner and weighs 6.3 ounces. Closed length is 5 inches. The Cyclone offers the ability to enable or disable the SpeedSafe function. Set it one way and you get fully manual operation. Set it the other and the SpeedSafe system engages to assist blade opening smoothly and easily. Either way, you get the styling, precision, and performance you expectand deservefrom Ken Onion and Kershaw.